Cone 05. 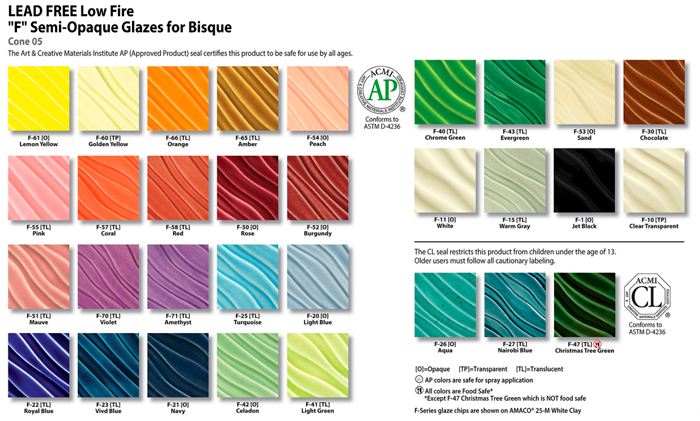 AMACO® F-Series Glazes are fritted, leadless compositions. They are semi-opaque and fire with a high gloss. Colors are more intense and brilliant than those of many other glazes. Because AMACO® F-Series Glazes are leadless, they are recommended for pottery dishes as well as all types of pottery made from pottery clays. AMACO® F-Series Glazes in liquid form are ready-to-use in pint jars. AMACO® F-Series Glazes have a recommended firing temperature of Cone 05 (1911°F, 1044°C). These glazes must be applied on a mature Cone 04 (1971°F, 1077°C) bisque by brushing, dipping or pouring.